With a turnover of 2.23 Billion USD and overall marketing spend of roughly 50% per film, the film business in India is one of the highest spenders in marketing promotion. A decade back most of this promotion was straightforward. It had limited number of channels to spread the marketing message to a less distracted target audience. With the dawn of the social media and ubiquity of smartphones, reaching an attention deficit audience is now the biggest challenge for production houses and their marketing teams. Which channels to focus on? How to customize the message for each channel? How to allocate channel wise spend? These are some of the questions that challenge today’s film business. This whitepaper attempts to highlight the strategic and tactical challenges facing the current film business in India and how a predictive analytics framework can address them. We’ve used back tracing algorithm and achieved 94% prediction accuracy. What are the reasons for disparity? For over two decades’ analytics has been helping industries evolve their business models to address the myriad of challenges emerging in competitive markets. Industries such as CPG, Retail, Healthcare, Banking and Telecom are the pioneers of analytics directed business decision making globally. 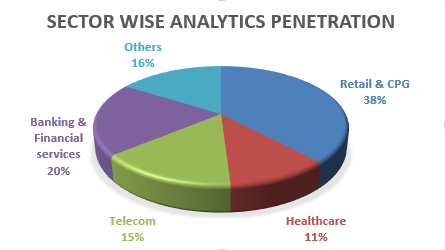 According to a study done by Everest research, the combined adoption of analytics by these sectors accounts to more than 80% of the overall analytics penetration in different sectors. Analytics adoption in these industries started with data reporting and has grown over the last couple of decades to provide a wide range of customized solutions. These solutions constantly assess the business impact and provide feedback on areas of improvement for business decision making. With the demand, these solutions are increasing at the volume and in sophistication as well. As the analytics adoption in these industries continues to fuel informed decision making, industry domains such as travel, logistics, film production, gaming, utilities and energy are still far away from adoption of analytics in their business. 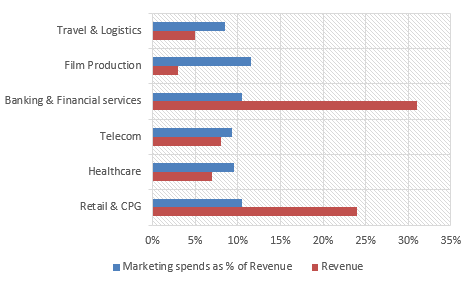 Even though the marketing spend in these industries have a similar revenue proportion to early adopters (CPG, Retail), these sectors see low adoption of analytics. Despite the lowest revenue amongst industries, Film production is the highest spender in marketing. Data Synthesis – Industries like CPG, Retail, BFSI, Telecom gather vast amount of data at most granular level about their customers and stores. They also use rigorous primary & secondary market research to answer questions around product development, pricing, placement & promotion. By contrast, it becomes difficult for the late adopters to address this problem of synthesis as data collation is a challenging task. Data Processing – In analytics, the early adopters often feel excited about using the new / emerging technologies for faster and effective data processing. Moreover, over a period of time, they have been able to depreciate the investments and are reaping higher ROIs on data processing. The new industries need high initial CAPEX to start the journey and keep the pace. The emergence of social media, smartphones & digital advertising has resulted in an era of an “always on” consumer who is interested to directly engage with the brand and other consumers on their platforms. Such activities by a consumer lead a digital trail, commonly known as “big data”, which can now be mined for insights around brand usage, consumption patterns and ad effectiveness. The industry is also witnessing reforms in the traditional ways of data collection. For example, in in-cinema advertising, business models on contracts are shifting from lump sum deals to pay per view deals, which is a better way to measure the efficiency of the medium. With an overall revenue of 138 billion INR and a projected revenue of 1660 billion INR by 2017*, with theatre revenues accounting for the major chunk of the total revenue, Bollywood can no longer be considered a fringe industry. Similar to banking or FMCG, marketing promotions for films account for a major spend in the industry and are no different from the planned marketing campaigns of product launches. It is imperative that the industry manages it’s spend and brings in data informed decision making to identify channels that can result in the highest ROMI (Return On Marketing Investment). The rise of multiplexes has led to increase in per ticket realization, cost-effective screening by providing theatres with low seating capacities. Also, these multiplexes have improved film-going experience for Indian audiences. Digitization of films by studios such as Real Image and UFO films has enabled faster distribution from 500 prints per day to 1500 prints per day. As a result, revenue generated from the first week of release is almost 60-80% of the total theatrical revenue. The filmmakers now have an elaborate market mix which includes Television, radio, digital advertising, print, OOH, social media, mobile apps, YouTube videos etc. Shift from film promotion by spreading awareness prior to release, to audience engagement using creative campaigns across social media. For example: Marketers of the film ‘PK’ posted behind-the-clips scenes on Facebook and selfies of the promotion tours were put out on Twitter. Besides this, a special app ‘MyPKPoster’ was also launched to let audience try out creative versions of PK. Increasing competition from international films (Hollywood) as well as regional films whose budgets and production finesse is improving consistently. Rise of the “content driven” audience. The average filmgoer is increasingly becoming more interested in stories that are relevant to the Zeitgeist. It is now widely accepted that a film will not get a good opening weekend unless it is heavily promoted. These days, a film’s success heavily depends on its intelligent omni-channel marketing campaigns. The marketing promotion for most films is becoming increasingly digital with promotion happening across TV, Radio, Social media websites such as Facebook, Instagram, Twitter to mobile gaming. Without proper marketing development, a film with fantastic plotlines, actors, sets, and special effects may fail to attract the audience. A successful campaign needs a thoroughly devised plan that focuses not only on the type of marketing channels but also on how they are to be connected (TV ads might drive people to check out the Wikipedia page or YouTube channel). As a surprising fact, a typical Indian film takes 6 months in planning and 18 months in execution, whereas a Hollywood film takes 36 months to plan and 12 months to execute. All these trends make this industry latent enough to gain enormously from analytical frameworks and applications. Analytics can jots down these trends in the form of data points to provide quantum of spend per marketing vehicle, coupled with the time gap between any two activities to account for audience’s memory retention/decay factor. We initiated an 8-month analysis of the Indian film industry. Before diving into the solution, let’s briefly understand how this industry works. We‘ve used a back tracing model by initially estimating the first week’s box-office collection. First week’s collection will serves as a target set by film producers. Then, we find the contribution of each marketing activity and other factors associated with film’s success (such as genre, star cast etc). With DVD sales declining and mobile/online rights yet to gain momentum, studios strive to make back all of their money and more during theatrical runs. This estimate is heuristically computed to serve as a realistic target for the producer. Producers have the information about the no. of screens in each territory. By classifying these screens into regular theatres, small multiplexes and large multiplexes, we can estimate the total no. of seats. For example- on an average, there are 200 seats in a regular theatre, 150 in a small multiplex and 225 in a large multiplex. Based on past records of the region and the films with similar banner, production budget, crew, genre, time of release etc., the average ticket price can be assumed to define a pragmatic box office target. Spend – It is the most important factor that needs to be optimized in order to achieve high ROI. Duration – Time is money. The producer is charged for every single day in case of posters/banners, for every single second in case of TV/radio ads. Hence, duration too needs to be optimized. Gap between activity and film launch – Long gap between two marketing activities may kill the hype created by the former, hence careful planning is required to account for audience memory. Team – Audiences often have expectations from the actors, directors, music directors etc. who have previously shown a good performance. Therefore, first week office collections are less dependent on the content and more on the famous names of the team members. Genre – Past records of other films in the similar genre (action/drama/comedy etc) are a good indicator of new film’s performance. Other indicators that answer ‘whether the film is a remake or sequel of a hit film? Does the film have VFX effects or is it a 3D film?’ are also factored in. Now comes the external factors that determine the footfall of audience to the theatres. Release season – With the proliferation in the number of films released, the release date has become critical now. Hence, tent pole films are released on important weekends like that of festivals, summer holiday etc. On the contrary, a film might not do well if its release date coincides with major events such as Cricket world cup or Indian Premiere League (IPL) season. Number of concurrently released films – If other films (including Hollywood and regional films) are also released in the same weekend, then the odds of the film to attract footfall to its theatres decreases. 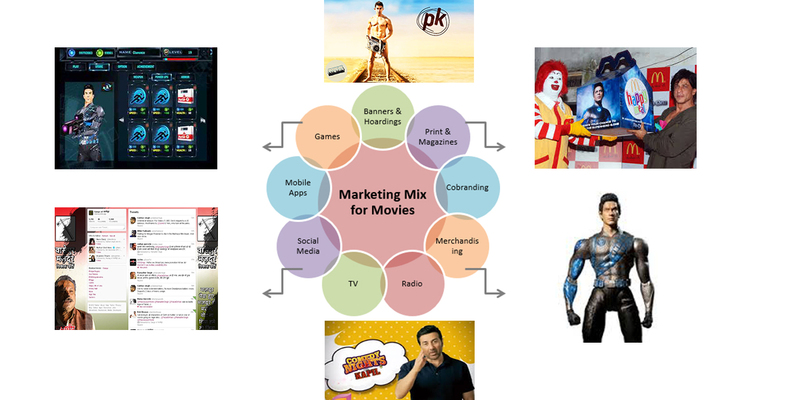 Genre and team of these films – It is not possible to muster data on marketing activities of competing films but their genre and team information can be passed into the model. We gathered and used data for all the above factors and created a predictive algorithm to forecast first week collection at box office. The model had 94% accuracy. The algorithm (back tracing algorithm) was used to optimize and distribute spends across marketing activities in order to achieve the forecasted box office collection. The methodology incorporates time decay and position based algorithms to effectively spread marketing activities over time. The above solution is customized and delivered in a user friendly interface that allows to simulate factors for upcoming films making it dynamic enough to empower the production house with effective decision making at any time in the future. Effectiveness: What is the relative efficacy of each marketing touch? Combined effects: What synergies exist for marketing communications? Arrangement: What is the Halo effect of one marketing activity over other? Frequency: How many touch-points are needed to achieve the target revenue? Time decay: What is the wearout factor for each activity? Dynamic solution: To top this the solution is made dynamic to let the production house play around with it to incorporate any changes found in the later stage. Scalable: Optimized for new mediums, as it allows the production house to enter the data of the upcoming film and also modify any of the data point or constraints. 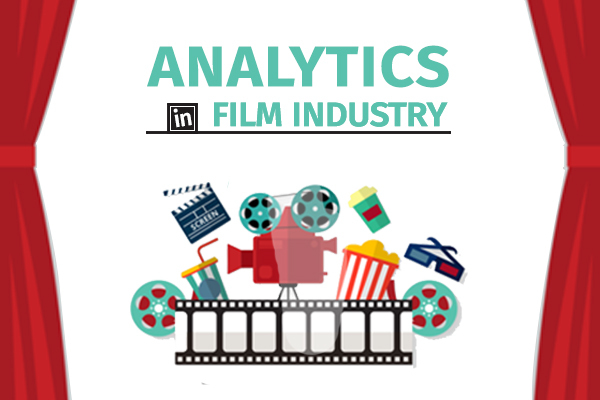 The emergence of new technology and the era of ‘big data’ has enabled such unconventional sectors as film industry to reap the benefits of analytics. Moreover, the latest trends witnessed by this industry have brought in a plethora of platforms to connect with the consumers, a scenario that calls for a more systematic approach to increase both the efficiency and efficacy of promotions through each platform in order to achieve maximum possible ROI from minimum possible investments. On top of this, the last decade has not only seen an increase in the diversity of devices on which entertainment is consumed but also in the profile of the audience that is now getting used to custom content. Profiling of customers for better targeting, personalization of content on select mediums etc. comprise endless opportunities to benefit from analytics. To conclude, we will not be wrong to say that such industries are like gold mines awaiting new frameworks to extract the most out of it. Hope you liked reading this article. Please share your experience / opinion on this interesting topic. Sanjeev Mishra is co-founder and CEO of Convergytics Solutions- an analytics consulting company. 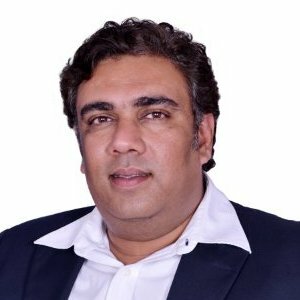 With 18 years of experience, he has been instrumental in institutionalising analytics in Fortune 50 companies across industries and domains in developed and developing economies. Mansha Sharma is an avid practitioner of analytics and in a very short time of 2 years, has become a sounding board for analytics in her organization. 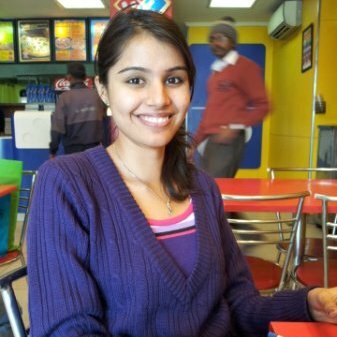 She enjoys providing solutions through transformation of business concerns into mathematical problems. Thanks Sanjeev and Mansha for giving a detailed explanation about how business in film industry works and application of analytics to run a profitable business. Could you share some insights about the success of low budget movies that you mentioned? Did they in some way optimize their marketing spend? The predictive model makes a forecast prior to the release of the movie, however I believe the story and the reviews (audience, IMDB, Rotten Tomatoes, critics) affect the footfall/revenue for the first week and is difficult to record in advance. How do you ensure the model efficacy in this case? This is great. I love this blog, you guys have mastered the entire data lifecycle and present it in a very interesting manner.